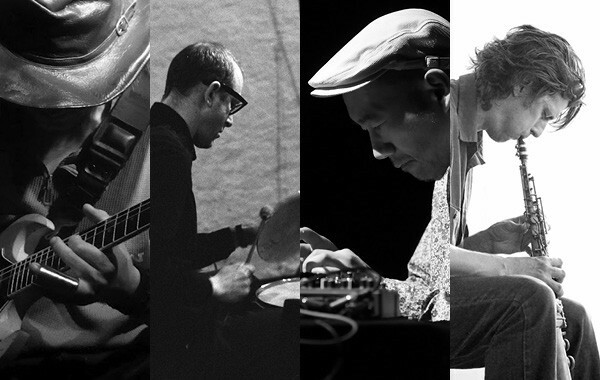 Before their tour started October 30, Tetuzi Akiyama (guitar), Bryan Eubanks (saxophone, electronics), Jason Kahn (drums, percussion), and Toshimaru Nakamura (no-input mixing board) had never played together. But subsets of the quartet have been joining up since the 90s, predominantly in settings that showcase a shared interest in using self-restriction to elicit strong but minimal gestures. On recent recordings, however, they cut loose. Kahn, who has long favored spare electroacoustic instrumental setups, uses bells and a full drum kit to engage in frenetic, jousting action with Nakamura and Akiyama on Between Two (Ftarri/Meenna), and his improvisations with Eubanks on Drums Saxophone Electronics (Intonema) repeatedly build from restrained explorations of timbre to high-pressure microbursts. What connects these recordings to the players’ earlier works is a purposefulness that makes each strike, strum, and voltage-fried hiss really count, not to mention a canny exploitation of a room’s acoustic properties, in which the liveliness or deadness is an essential aspect of the music rather than something to ignore or overcome. None of these musicians have played Chicago for several years; don’t pass up this rare chance to see them together.